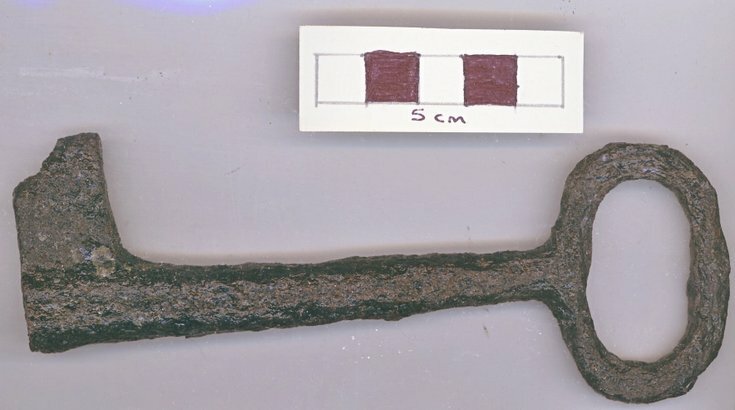 Iron Key, discovered by metal detectorist on Pitgrudy Farm, Dornoch, with a flattened oval bow (head), round tapering shank, solid wedge shaped bit (end) with partially hollow end along shank. Barrel key, possible skeleton key. Dated possibly late 17th – 18thC discovered by metal detectorist on Pitgrudy Farm, Dornoch. All objects in the 2012.028 series were initially submitted to Treasure Trove, then returned to Inverness Museum Museum and ultimately transferred to Historylinks Museum. The objects were given an Inverness Museum Object Entry Form FN 2200 reference, described and bagged individually or grouped. The Inverness reference number and object measurements appear on the individual bags.